Kittima Village 1. 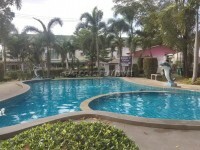 This lovely 2 storey townhouse is located along Huay Yai road to the East of Jomtien. It has easy access to Pattaya City, local amenities, schools, hospital and several golf courses. The house which is in excellent condition consists of two bedrooms, separate living and dining area, fitted European kitchen, storage, full air conditioning throughout, and hot water bathrooms and kitchen. The property also has good size garden, covered parking area and has reserve water tank and pump. It already comes equipped with telephone line, internet, Wi-Fi, Cable TV connections. 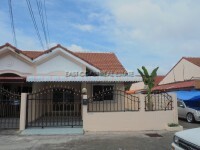 Available for sale fully furnished with title deed held under Thai name.